This compact full performance camera is ideal for discrete video surveillance in indoor and outdoor areas. It is weather tight, vandal proof and has built in IR illumination making it suitable for day and night use. Wide Dynamic Range (WDR) further improves picture quality in difficult lighting conditons. This camera has full 360° Panoramic vision. Wall mount, ceiling mount or table mount modes. IK09 impact rated for vandal protection. Metal body and tough polycarbonate cover. E-PTZ, 3D-DNR, privay masking and motion detection. 4000 x 3000 @ 18fps maximum resolution. Ultra High Resolution. 12MP resolution is 6 times the clarity of HD image quality. 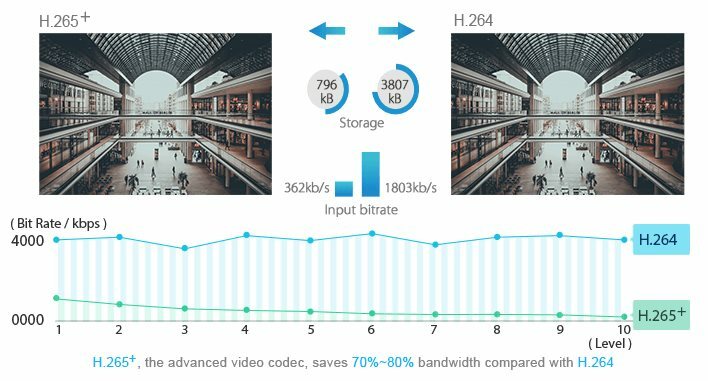 The high efficiency H.265+ codec enhances its video quality while maintains a reasonable bitrate. The camera could easily reach the effect of over 4 regular network cameras with higher efficiency. 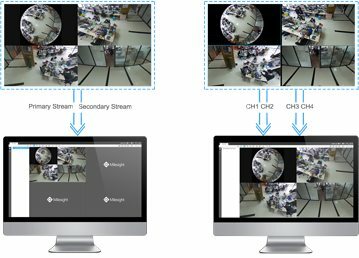 Bringing 360° surround view with zero blind spots, it is able to provide comprehensive coverage of open areas such as airports, shopping malls, parking lots, retail stores, offices and more. The fisheye IP Camera features 12MP ultra high resolution for better restoring the images to guarantee superb image quality. The camera is a special model which produces spherical image and will have the de warp process to adjust the original images to fit human eyes. The process may cause the pixel losing. 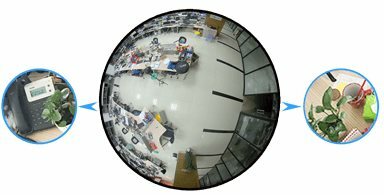 That is why the high resolution is vital for a fisheye camera. Milesight Fisheye Camera offers Bundle-Stream Mode and Multi-Channel Mode to meet different needs. The Bundle-Stream Mode combines all the channels into one and sends to NVR or VMS, which is easy for compatibility. The Multi-Channel Mode sends all the original channels to NVR or VMS, so the channels can be modified separately. Supporting three different installation including “Ceiling ”, “Wall” and “Flat”, the Fisheye Network Camera interface fits for different installation requirements in various circumstance. Each Installation has different well-matched display modes. Users can easily find the proper ones according to practical situations. Moreover, the “Channel” allows to focus on a specific channel to explore the details. Featuring IP67 Weather-proof and IK09 Vandal-proof, the camera shields its sensitive electronics from dust and water, which ensures stable operation in all weather conditions. Also protect itself from the unexpected violence, guaranteeing the smooth running to avoid potential damages. Screw-free Design. The body design of the camera insists on the idea of neatness and exquisiteness. As a whole, the screw-free design and Multiple-interface Cable keep the body neat. 360° (ceiling or table mount). 180° (wall mount). 18fps @ (main stream 4000x3000, secondary stream 1024x1024). 25fps @ (main stream 3000x3000, secondary stream 1024x1024).